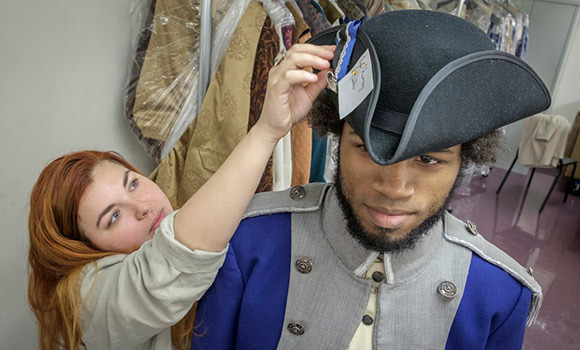 UNCG alumna Sydney de Briel '16 MFA assists current student Benjamin Ramsey with a costume fitting for "The Barber of Seville." It’s a line of opera that many know, perhaps from Saturday morning cartoons. The classic line is from “The Barber of Seville,” and next weekend, Greensboro Opera brings Rossini’s work to UNCG Auditorium for two shows, Jan. 12 and 14. UNCG alumni, students and faculty are an integral part of the production. In this fast-paced boy-meets-girl story, the principal cast members will be joined by several UNCG alumni in supporting roles – Stephanie Foley Davis, Jacob Kato and Donald Hartmann, also a UNCG faculty member who first performed with Greensboro Opera in 1982. The chorus includes students Christian Blackburn, Ian DeSmit, Wesley McCleary-Small and Benjamin Ramsey. The stage crew is comprised entirely of UNCG students, staff and alumni, and the orchestra includes 12 faculty members. Jim Bumgardner, UNCG alumnus and visiting voice professor, serves as chorus master. Unlike the months-long rehearsal and production process that students experience in campus productions, Greensboro Opera performances come together quickly and give students exposure to the fast-paced professional world. “It’s an experience that they couldn’t learn in a book – this is an opportunity for our students to share the stage with people at the highest level of their profession,” said David Holley, Greensboro Opera artistic director and UNCG director of opera. The production serves as career preparation for students. It’s also an opportunity for the campus community and beyond to experience and enjoy opera, many for the very first time. For more information and to purchase tickets, visit greensboroopera.org.